This tote bag is one of my new favorites. The pattern is from Quilts and More magazine Spring 2016 edition. Instead of using quilting cottons I used upholstery fabrics including strips from sample books, a little printed linen and a little dressmaking fabric. I chose the fabrics and cut it out. 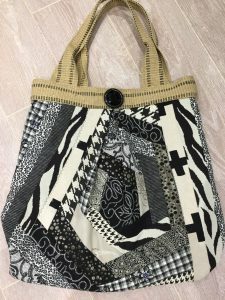 My sweet Mother did the piecing and I sewed up the bag including the jute handles which I love. Thank goodness for my Juki machine as this was a lot of layers to sew through. I chose a large black antique button for my embellishment. We made a bag for Mother too except hers is khaki and brown. This is a large bag (24 x 20) excluding handles.